Decisively responsible for the success of Guhring is the strategy to totally and uniquely control own production. We pool all for the tool manufacture and the necessary expertise under our roof. Our in-house carbide production, in-house machinery and plant engineering, in-house coating technology as well as our know-how in geometry development ensure the technology leadership in rotary cutting tools. As technology leader with a holistic approach we aspire towards perfection in metal cutting. In-house research and development centres service all company sectors. Here metal cutting industry trends are co-designed and implemented. 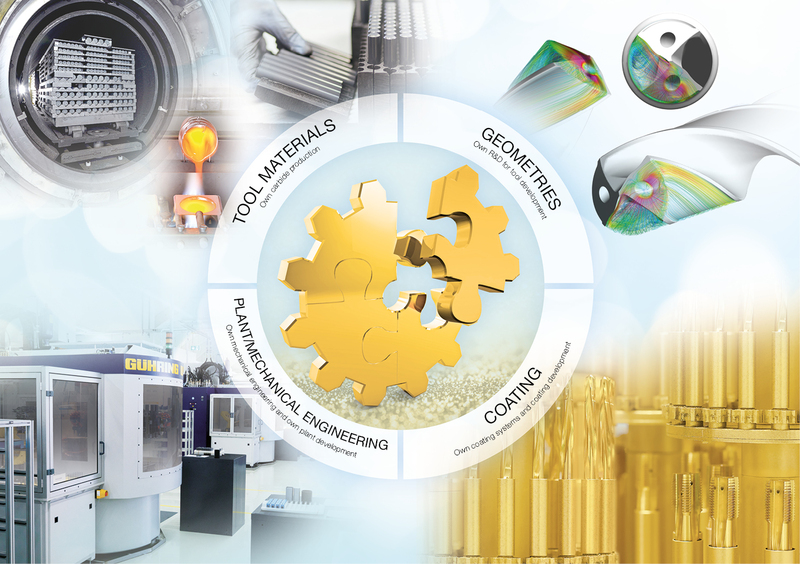 Whether it is new materials or modern machining strategies, thanks to research and development Guhring secures the technology leadership on the market in rotary precision tools. Naturally, our customers also benefit: Test facilities, where exclusively customer trials are run under our central quality management ensuring our standards across all tool parameters are achieved. Therefore, the in-house manufacture of our tool materials represents an important pillar of tool manufacture. Production is destined for world-wide distribution to our subsidiaries as well own customer group. Guhring provides different carbide qualities for highest requirements – Made in Germany. It is our claim to provide an individual solution for any customer requirement and any application. With a team of 330 employees, an in-house R&D as well as our own sales department we produce and distribute approximately 1400 tons of carbide per year. As early as the 1920s Guhring started to build its own machines. Today, a century later, approximately 200 employees take care of equipping tailor made machines for our own production facilities. These guarantee world-wide uniform quality standards and with a high level of automation contribute to the efficiency of our production. For the production of our standard as well as our special programme it enables us to manufacture precision tools made-to-measure to both our quality requirements and customer requirements. Decades of grinding know-how satisfies the increasing demands on the precision of cutting geometry and the materials in general. The in-house R&D harmonises the progress in geometry development as well as the adaptations of the macro and micro design of the cutting edge. Important parameters hereby are cutting edge preparation, web thinning, major and minor cutting edge design as well as the cutting edge corner. Already at the beginning of the 1980s Guhring introduced the world-wide first TiN-coating and set a milestone in the machining world. Since then the company’s in-house coating department has established itself, developing and producing new coatings as well as the necessary coating technology.